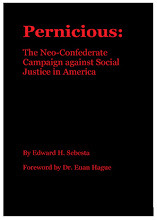 Anti-Neo-Confederate: Transaction Press of Rutgers is a publisher of Neo-Confederate books. Transaction Press of Rutgers is a publisher of Neo-Confederate books. Transaction Publishers is one of my major sources of Neo-Confederate books. It is at Rutgers University in New Jersey. They also publish a "Journal of American Ethnic History" and a series of books on Africa. About the "Disturbing Graves" pre-text. UPDATE: Texas Sons of Confederate Veterans upset with this post. Maybe "Southern Partisan" is dead after all. "Washington Post" Columnist Colbert King article, "Rise of the New Confederacy"
Upcoming movie, "12 Years a Slave," review and trailer at "Slate"
League of the South Billboard in Alabama taken down resulting in national publicity. "Daily Beast" article, "Racists on the Prowl," involves neo-Confederates. Frum Forum understands what neo-Confederacy is all about. Primary documentation website of material not included in the "Confederate and Neo-Confederate Reader"
Link to web page on "Neo-Confederacy: A Critical Introduction"
I am one of three editors of the book, "Neo-Confederacy: A Critical Introduction" which is published by the University of Texas Press. The following is a link to the book's description. Book published by Univ. of Texas Press Additionally, I am a co-editor of the "Confederate and Neo-Confederate Reader: The 'Great Truth' About the 'Lost Cause'." I am academically published in leading journals. My curriculum vitae Why is this important? Please read My paper on a tour of the Red and Blue States, "Breaking the White Nation"
Neo-Confederate Links so you know what type of people they are.